By: Compiled by Rev. Albert J. Hebert, S.M. 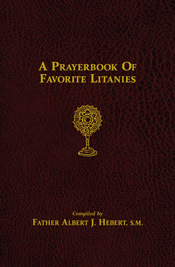 A Prayerbook of Favorite Litanies will add a new dimension and heightened devotion to your daily prayer life. This traditional form of responsive prayer is modeled after the recitation of the Psalms. It is a well-known and beloved form of prayer for both public and private devotion.